Common Name : Chicory, Endive, Succory. Habitat : Cultivated through out india. Uses : It was believed that the plant could purify the blood and liver, while others have relied on the herb for its power to cure passions of the heart. 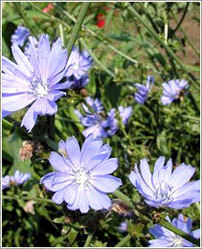 Chicory continues to be a popular herbal remedy due to its healing effects on several ailments. Chicory is taken internally for loss of appetite, jaundice, gallstones, gout and rheumatism. In addition, the leaves of chicory may also be used as compresses to be applied externally to ease skin inflammations and swellings. As a mild diuretic, it increases the elimination of fluid from the body, leading to its use as a treatment for rheumatism and gout. The root and the leaves are appetizer, cholagogue, depurative, digestive, diuretic, hypoglycaemic, laxative and tonic. It favors blood circulation by making blood more fluid and allowing it a better travel through vein and arteries.